Here is the second installment with the rest of the varieties I'm growing. Peppers - I love peppers of all types. I enjoy traditional bell peppers and the hot ones and I wanted grow some that were a bit different. Ozark Giant - A traditional bell pepper, which will give you lots of stunning large peppers. Purple Jalapeño - A traditional jalapeño which changes to a rich purple color before shifting to red. Most people pick jalapeños when they are green and frankly they aren't that good. If you leave them on the plant, they go to purple, chocolate and then red and they are hotter and taste much better with a really nice sweet taste. Corno di Toro - The "horn of the bull". A wonderful pepper which is almost impossible to find in any market outside of Italy. Sweet with a hint of spice, they are amazing when roasted. Sigaretta de Bergamo - Another Italian variety which is very hard to find. Fry them or throw them in a salad. India Jwala - If you like hot chilies, this is the one. 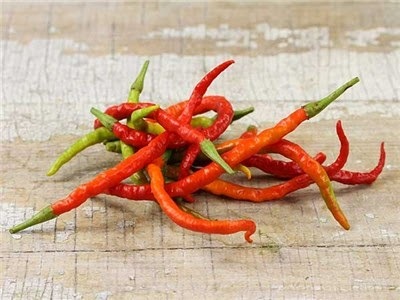 This is the primary chili grown in India and used in the spicy Indian dishes. Extra hot and if you let it mature to red, it takes on a sweet flavor. You can dry these as well. Carrots - So easy to grow. Just seed them directly in the bed, then and then havest as needed. you can reseed for a late crop. Jaune Obtuse du Doubs - An heirloom Frech market carrot, which is very old. Mentioned in 1894, as originally for livestock. Those were some lucky cows. Safe to say you will never find this one at your local market. Watermelon - This might be my undoing, as I don't have space to grow them in the raised beds, so I am taking a chance and growing them along the borders of my yard. The squirrels may have a feast. Sugar Baby - I am growing these, as my grandparents always did and I remember them as being so sweet and good. Guess it's safe to say I got my love of gardening and farming from them. Collard Greens - I have decided to grow Georgia Southern as every catalog says they are the best collards. Onion - I am going to give these a try and see how it goes. I remember as a boy, that they are really earthy and wonderful, so I hope mine turn out as well. Juane Paille des Vertus - Described as a lovely French market onion, which is very old and known to have been the one onion that supplied Paris throughout the winters for two hundred years, so it must be good! Garden Update- The beans are in!